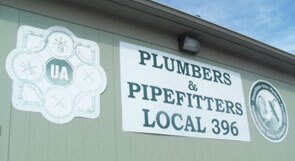 The city of Youngstown, Ohio and its surrounding areas have had their share of ups and downs, but one thing that has remained steadfast and sure is Plumbers & Pipefitters Local 396's commitment to excellence and a powerful work ethic. Despite the loss of thousands of manufacturing jobs and the erosion of Northeast Ohio's once mighty industrial base, Local 396 members and leaders continue to make their mark with hard work and dedication on a number of area projects. One such project was the launch of General Motors' Chevrolet Cobalt, GM's new generation of small cars. The Cobalt is being built at the Lordstown, Ohio plant. LU 396 members undertook the task of reconfiguring and retooling the general assembly area and body shop, along with constructing a new state-of-the-art paint shop. Also, when WCI Steel, a Warren, Ohio mill which has employed UA members and other workers for many years, needed to perform a blast furnace shutdown, the company turned to Local 396 to get the job done. Yet the changing times have led the members and leaders of Local 396 to pursue work in other areas. Today, Local 396 members are found working hard in schools, hospitals, and homes, as well as the more traditional work in the Industrial sector. Click Here to read an article about us from the UA Journal. Click Here to read another article about us from the UA Journal. Click Here to read an article about UA Local 396 and Extreme Home Makeover.